I still haven’t been able to get over my berry craving, even though it’s currently February, and it’s costing me an arm and a leg. So when Lucky Leaf sent me a few cans of their pie filling, including raspberry, I thought that it would be a nice opportunity to feed my addiction without breaking the bank. 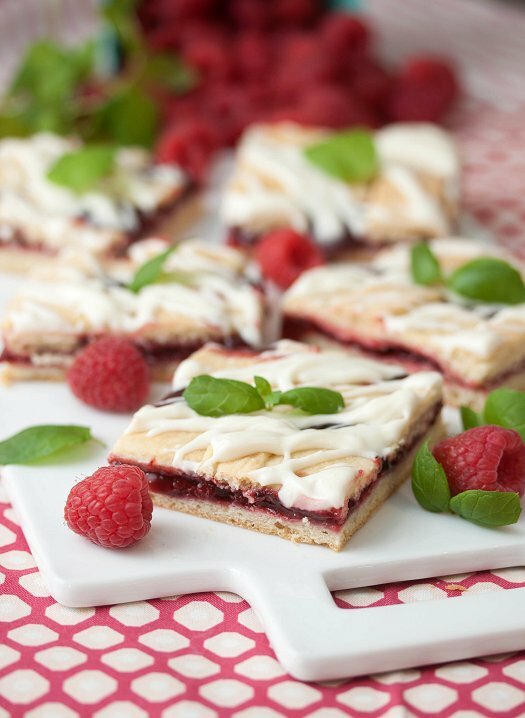 So after browsing through some recipes, I decided on these delectable raspberry pie bars. The dough is rolled out into a large rectangle, pie filling is spread on top, then more dough is placed in a lattice formation on top – then it’s all baked, chilled, and finally drizzled with a delicious cream cheese frosting before being cut into individual squares. I chose raspberry, but I think they’d be delicious with just about any variety of pie filling you’d want to use – I’m definitely looking forward to trying cherry and apple in the near future. I was not having the best day when I made these…not feeling well in general, kids acting crazy, you know how those day go…so when I took the dough out of the refrigerator to take the chill off and roll it out, I let it sit on the counter a little too long. It softened quite a bit, and I had a little bit of a hard time rolling it out, and forming the lattice crust. So, make sure you act quickly when you go to put it together! Once in the oven, it baked up beautifully. The filling stayed in place, and the dough got nice and puffy – creating a gorgeous bar. I let them cool for about an hour before I drizzled them and cut, and enjoyed them after dinner for dessert. Everyone really loved them, and it was great to have all the delicious flavors of a pie in a bar form. They’d be a perfect sweet treat for Valentine’s Day, either to share with your family – or that special someone in your life. And, it’s a break from all the chocolate that usually goes hand-in-hand with the holiday. 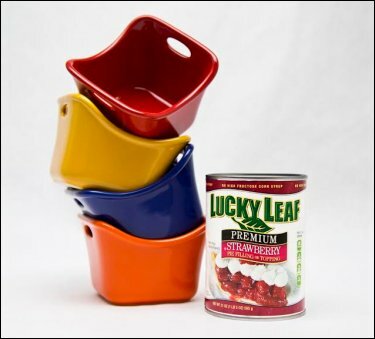 We’ve also got something else pretty sweet for you guys – a set of these adorable Rachael Ray Bubble & Brown Individual Servers, and a Lucky Leaf gift pack to go along with them! They’re perfect for individual servings of cobbler, bread pudding, or even something like a creme brulee. To enter, just leave a comment telling us what your favorite berry is. I’d say mine is blackberries. Giveaway will run from today through February 14th (Valentine’s Day) at 11:59 PM. I’ll select a winner using the handy, dandy Random Number Generator and contact the winner. In the bowl of a stand mixer fitted with a paddle attachment, cream butter and sugar until light and fluffy. Combine the flour, baking powder and salt in a medium bowl. Combine the eggs, milk and vanilla in a liquid measuring cup. Add the dry ingredients to the creamed mixture alternately with egg mixture, beating well after each addition. Divide dough in half, wrap in plastic wrap, and chill for 2 hours or until firm. Preheat oven to 350 degrees. Line a sheet pan with parchment paper or a silicone baking mat and grease with butter or non-stick cooking spray. Set aside. On a floured work surface, roll out one portion of dough into a 15-in. x 10-in. rectangle; carefully transfer to prepared baking pan. Spread evenly with raspberry filling, leaving a 1-inch border around the edge. Roll out remaining dough to 1/4-in. thickness. Cut into 1/2-in.-wide strips; make a lattice crust over filling. Place in oven and bake for 30 minutes or until golden brown. Cool on a wire rack. In a small bowl, beat the butter and cream cheese until smooth. Gradually add the confectioners’ sugar and milk until smooth. Drizzle over bars. Chill until set. Cut into bars. Disclaimer: Lucky Leaf provided me with products to sample. As always, all opinions and thoughts are my own. Definitely strawberries – can’t get enough of them when they’re in season. I’ve got to say I think my favorite is probably raspberries. God I really love them. I just LOVE strawberries. They’re almost in season out here, and I can’t wait to stock up! Gooseberry…pie. Difficult to find, time-consuming to prepare but impossible to forget that flavor! My favorite hmm… I like different berries. lol That’s a toughy. Something like this I’d have to go with Raspberries. Even though strawberry sounds really good too. 🙂 Strawberry banana is a good combo I bet that would be good too. Yumm!! I would say that I have a tie … Fresh, in season strawberries (especially the local ones I get from the Pungo area of VB) and wild blackberries. I eat my weight in fresh blueberries every summer! Nothing better. Strawberries to eat. Raspberries for cooking. Found a yummy cross berry of blackberry and raspberry called tayberries last summer that made excellent cobbler I hope they bring it back next summer. Will try it in jam. Blueberries – can’t wait for the season to start! Strawberries are always my favorite! I think my favorite is raspberries. My favorite is strawberries! Thanks for the giveaway! My favorite is raspberries and strawberries for coffeecakes and pies. Those look so good Laura-and thank you for the great giveaway too! A favorite berry? I love them all but my favorite is blueberry. Strawberries from my own patch! Raspberry is my all time favorite, with blackberry as a close second. This recipe looks great. May be making a variation this weekend! Blueberries for sure, with raspberries a close second. This pastry looks divine and I WILL be making it. Thanks for sharing! If I can pick only one, I will go with blueberries. Blueberries! I’ve made apple slab pie/squares before, and wondered about different fruits. I might have to experiment now… These look great! I am a blueberry girl, I have a really hard time with the tiny seeds in most of the other berries. I do love seedless raspberry jam tho! I would have to say fresh blackberries. Yum. blueberries! I used to say that I would work for the Maine blueberry council if they paid in blueberries! I love blueberries in cooked desserts. Raspberries are my favorites just to snack on. Raspberries, or fresh from the garden blueberries! OH that recipe looks amazing!!! My fave berry is strawberry!! Açai are my favorite berries! These look so delicious! My favorite berry is strawberry! I love strawberries and raspberries. They’re a delicious summer treat, especially if I am lucky enough to pick them myself! My favorite is a really ripe strawberry! Raspberries are great, but freshly picked strawberries are yummy too. Hello deliciousness! These look fantastic. I am drooling thinking about them with strawberry filling. Raspberries are my favorite berry! You do a lot with them!